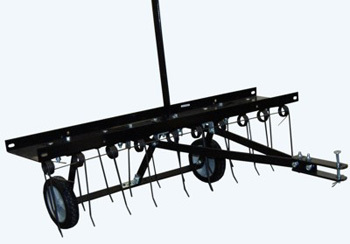 This simple to use towed dethatcher removes excess thatch from lawns. Suitable for year round use to bring matted layers of thatch and embedded grass clippings to the surface of the turf from where this debris can be collected. Using a dethatcher will bring life and colour back to your lawn. Sorry, we are out of stock of this item. We are presently out of stock of this item. Delivery of this item is FREE for internet and telephone orders only to mainland UK addresses (Highlands and Islands extra). Delivery normally next working day, but please allow three working days. Please note that this item is supplied for buyers assembly.